It never fails. The weather outside has to be absolutely horrid, otherwise it would be a break with tradition, it seems. On the day CJ and I drove to Tagawa Gardens for the 2010 Denver Orchid Society Spring Show, the interstate was shrouded in fog. The Rockies had completely disappeared, but we felt them as a solid presence somewhere beyond the grey banks to the west. I'm always sort of disappointed when the displays incorporate intricate carnivorous plants and gorgeous bromeliads, because these plants have no place at an orchid show, however beautiful and interesting they may be. Worse is when they incorporate props, like fiber optic UFOs and (shudder) garden gnomes. Aren't orchids amazing enough? Just let them be, people. 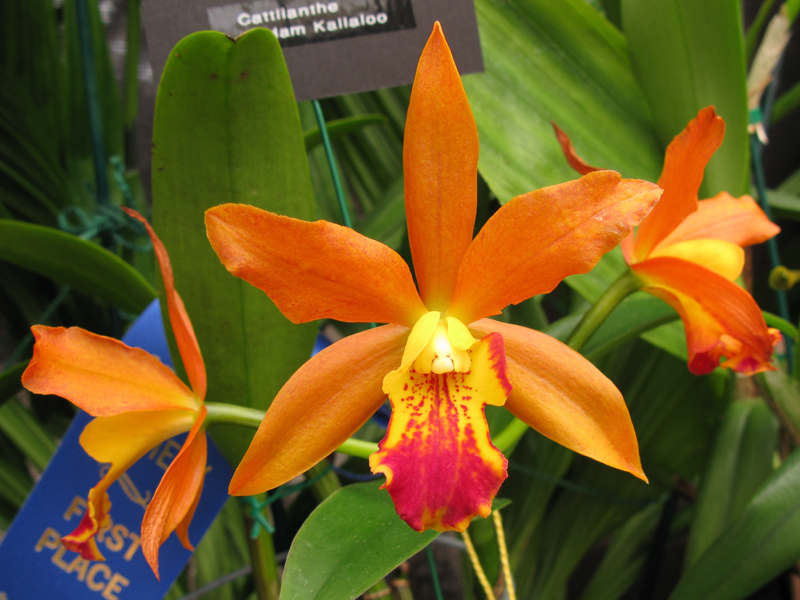 Thankfully, the Denver Orchid Society has too much good taste for that kind of thing. The well-constructed displays were fleshed out with lush, appropriate backdrop foliage; this fit the 'Orchid Oasis' theme for the show very well. Orchids from the genus Masdevallia and complex intergeneric hybrids from the Oncidiinae subtribe featured heavily in this season's show. For those of you who have absolutely no idea what the hell all that Latin means, here are some pictures of lovely orchids to enjoy! Large, round, flat and near-ubiquitous, those pink and white hybrid moth orchids can be found in the house plant section of almost any grocery store these days. Coming face-to-face with their wild relatives is therefore always exciting, especially when they look entirely different. 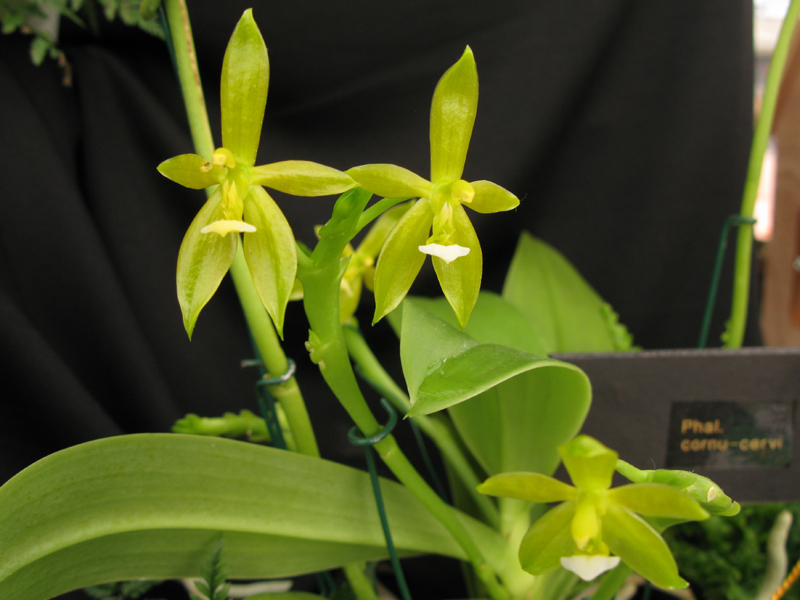 Feast your eyes on a lime-flowered version of Phalaenopsis cornu-cervi (above). The species name of this Southeast Asian moth orchid means deer-antlered, and it has curiously flattened inflorescences. With care, it can flower several times a year, unlike the store-bought hybrids, which generally flower only once a year. I also appreciate the fact that it has a starry shape, and not the flat, rounded shape we've come to expect from Phalaenopsis orchids. This adorable Dendrobium from Thailand bears minute flowers on leafless pseudobulbs that resemble a stack of green grapes. I think this would be a gorgeous addition to a cool little terrarium. The genus Dendrobium with its infinite variety: it's easy to see why it's my favourite orchid genus. 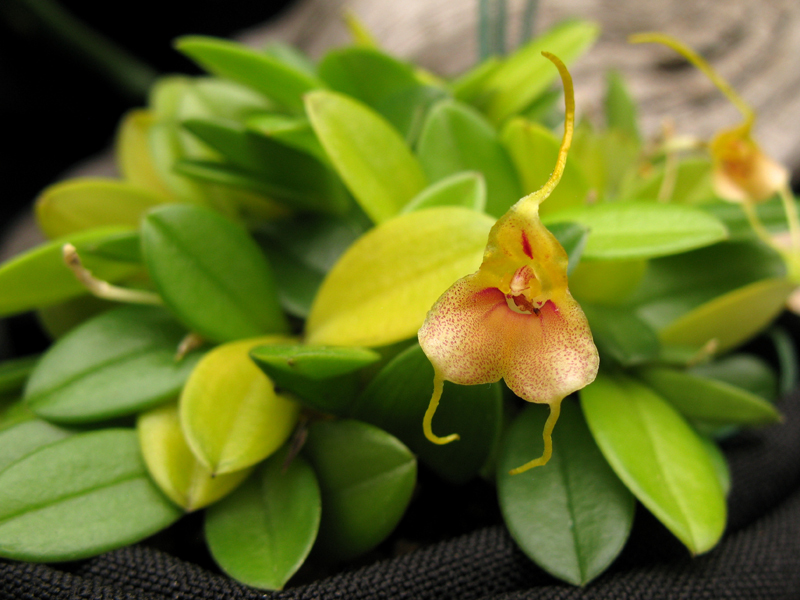 When it comes to Masdevallia, virtually the whole genus is composed of miniature species. Masdevallia pteroglossa, from the cool cloud forests of Colombia, is a pixie among dwarves: the entire plant above would easily fit inside a coffee mug. The species name means wing-tongue, which refers to the dimunitive lip, which is only visible as a small red structure in the centre of the triangular flower. 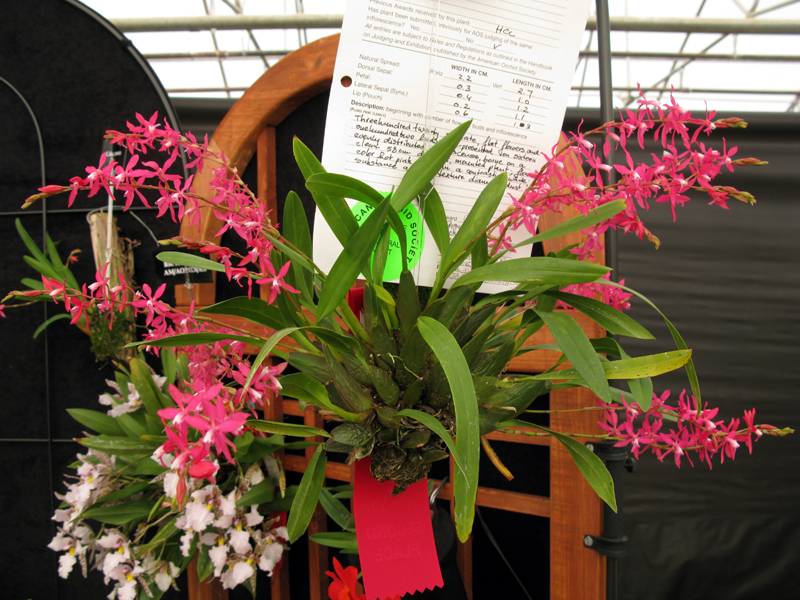 This lovely specimen plant above was awarded a CCM (Certificate of Cultural Merit) by the American Orchid Society. This coveted award is only bestowed on exceptionally well-grown plants. 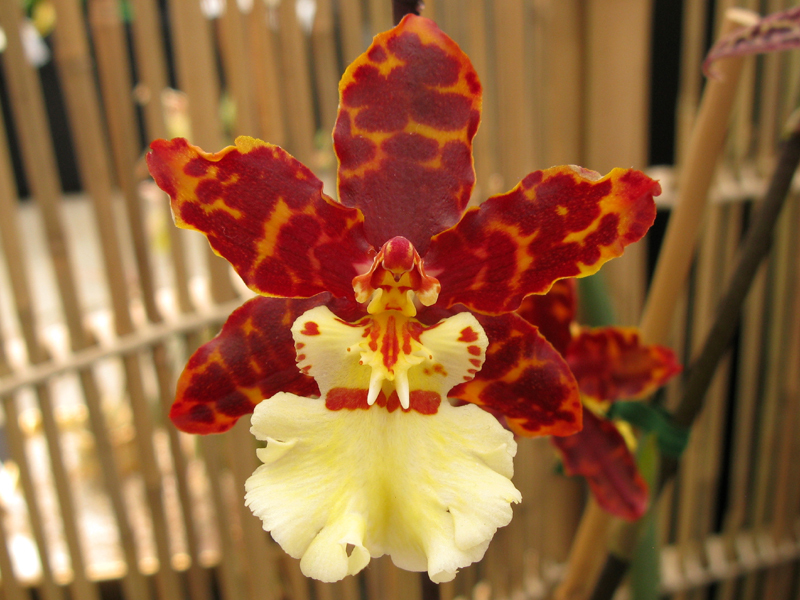 It commends the patient and skilled grower able to bring out the full potential of an orchid. This Cochlioda, a member of the Oncidiinae subtribe, had a total of 16 inflorescences on it, bearing 102 buds and 320 open flowers! The judges described the hot pink petals as having the texture of "diamond dust". Cochlioda rosea is native to the rain forests of Peru and Ecuador, where it must be an awe-inspiring sight. 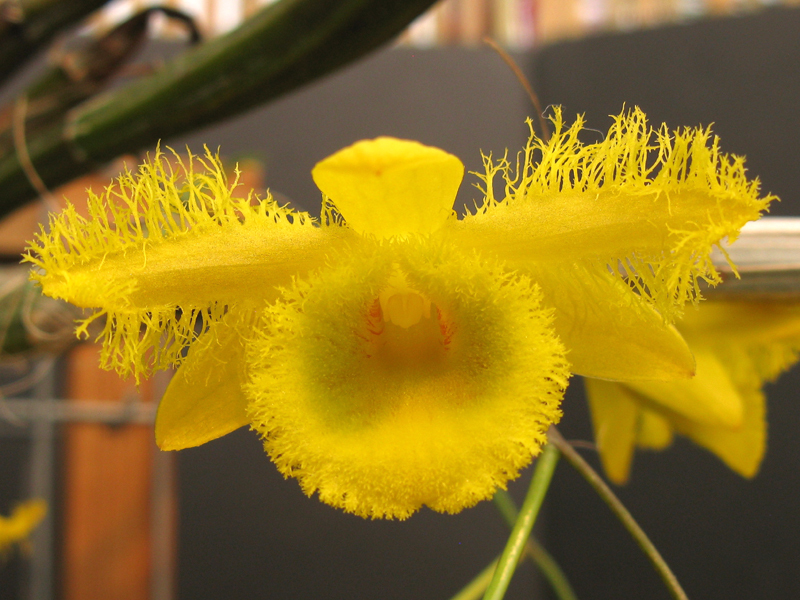 With more variations than you can shake a large stick at, the genus Dendrobium surprised us once again with the fuzzy-as-a-bumble-bee Dendrobium harveyanum. I loved the crystalline texture, the deeply fringed petals and the sweet scent. It appears dusted with pollen, but (as is typical for all orchids) the pollen is actually carried as sticky masses behind the anther cap, the small circular structure in the centre of the flower. This orchid is native to places in Southeast Asia with a monsoonal climate, and needs a dry winter rest in order for the flowers to develop in early spring. The absolutely enormous orchid above was awarded Best Flower and Best Grown Plant. Dendrobium Spring Doll 'Sweetheart' is one of the so-called soft cane Dendrobium hybrids, and was originally bred by the Hawaiian firm H & R Nurseries. 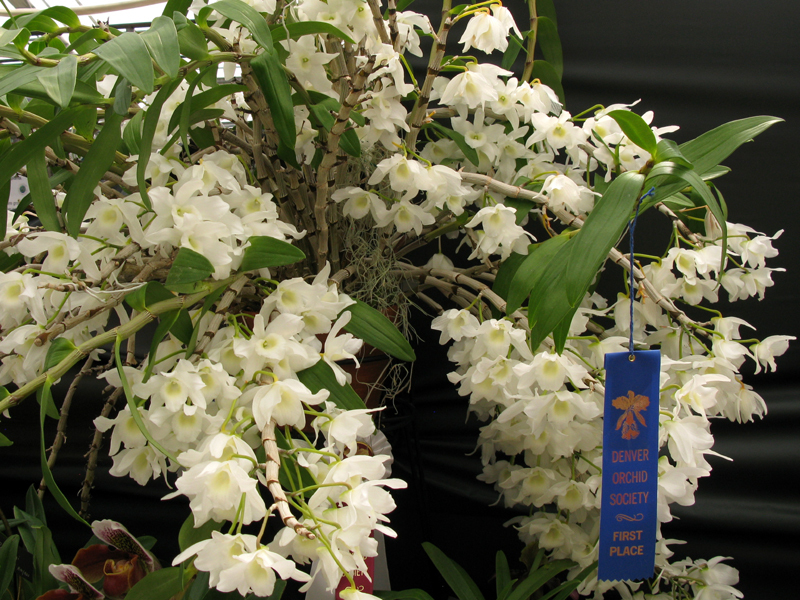 Soft canes have Dendrobium nobile and related species in their pedigree. Like Dendrobium harveyanum, soft canes need less water during their winter rest. This induces masses of flowers right before the growing season. I would recommend soft canes as good beginner's orchids, as they thrive on benign neglect. Tolumnia is an interesting genus, also part of the Oncidiinae subtribe. They are found on the islands of the Caribbean, where they grow as twig epiphytes constantly soaked by rainstorms and dried by the tropical sun. This requirement for rapid wet-dry cycles tends to make them slightly tricky to grow well. 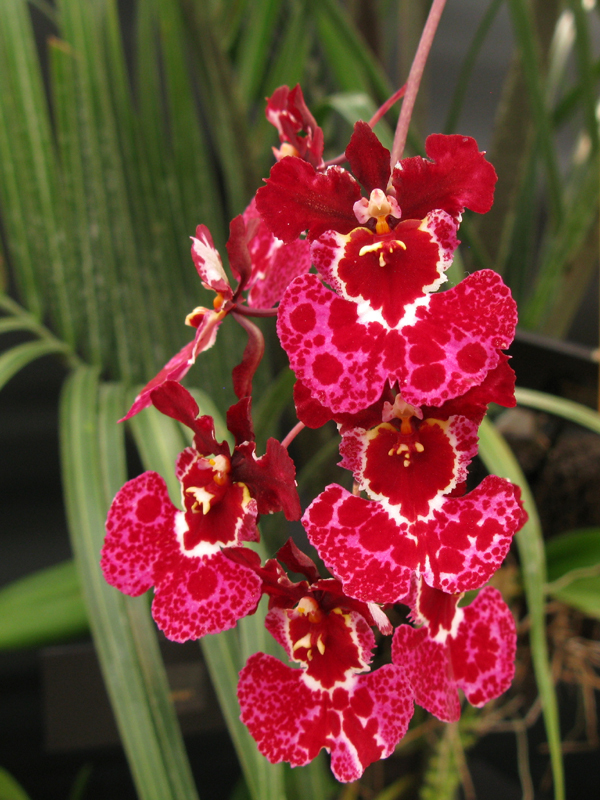 However, this example of the hybrid Tolumnia Jairak Rainbow was a carnival of a plant: several inflorescences bearing gaudy coral pink blossoms stained with carmine, like a gaggle of calypso dancers ready for a street parade. At every orchid show, there has to be one favourite. 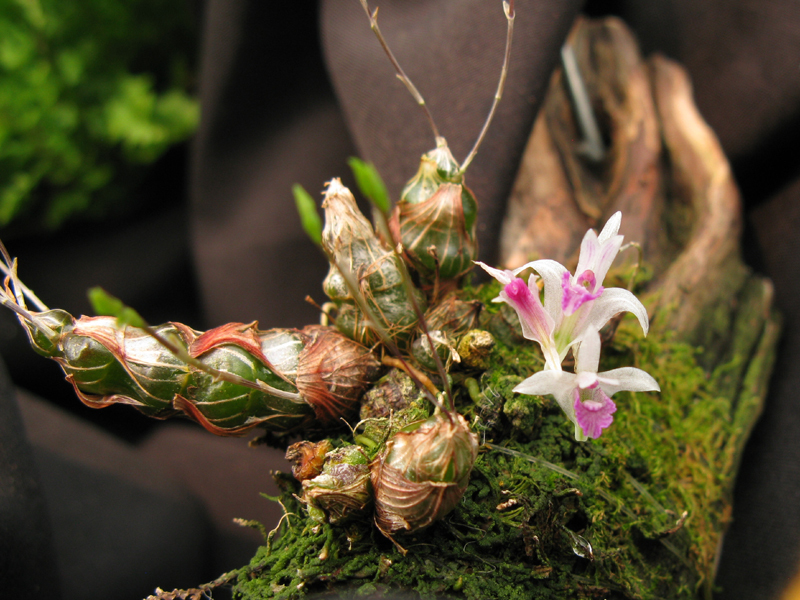 Dendrobium species tended to be the attention whores of orchid shows past. 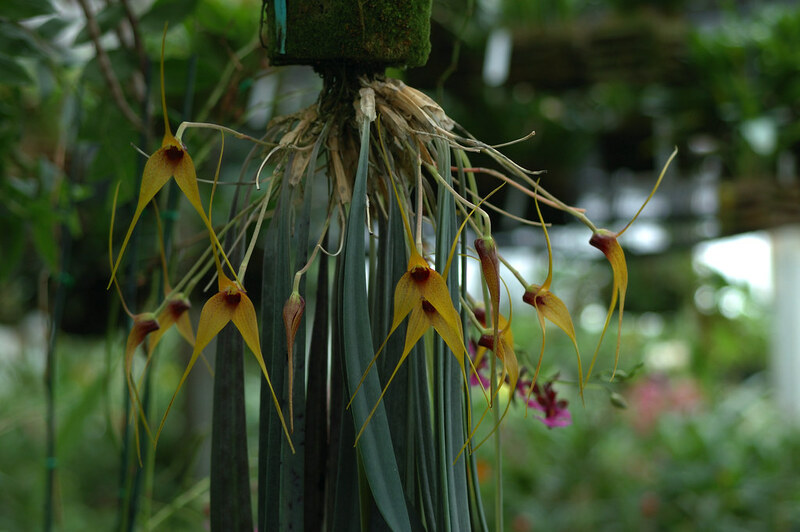 This time around, I became obsessed with a rather bizarre Masdevallia from southwestern Colombia: Masdevallia caesia. It has blue-grey leaves. It grows upside-down. It needs cool to cold growing conditions, like you'd find where the South American rain forests meet the Andes and the trees are constantly bathed in clouds. 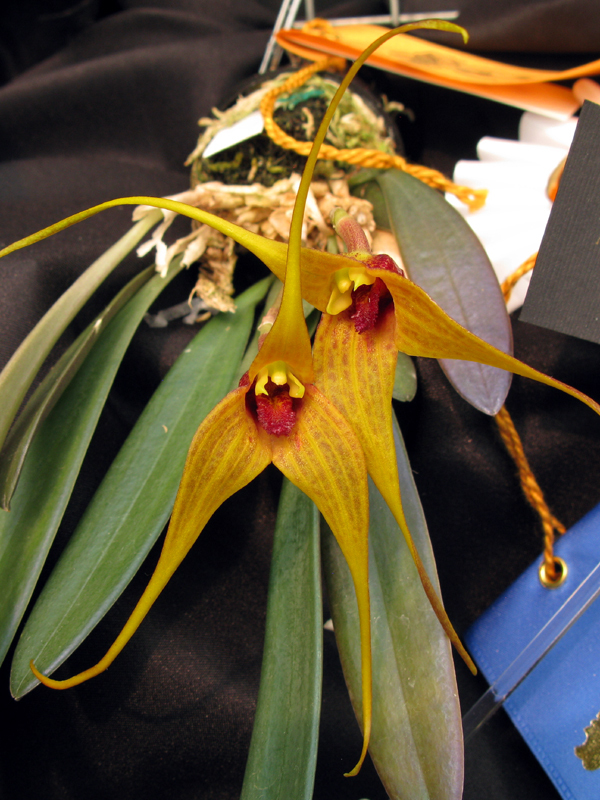 It has flowers that can be 23 cm long (and you thought all Masdevallia were small). The flowers have an unpleasant smell, and are pollinated by flies attracted to the furry red lip, which resembles decaying meat. It's exactly the sort of plant that sends those suffering from orchid fever into pure delirium. For more photos of my orchid show exploits, please visit my Flickr photostream.